The hosts of New Abolitionists Radio reflect on the past year in abolitionism and news related to 21st Century Slavery & Human Trafficking. Our profile in abolitionism is Henry Box Brown 1816–after 1889.
Who convinced you slavery was abolished in the USA? 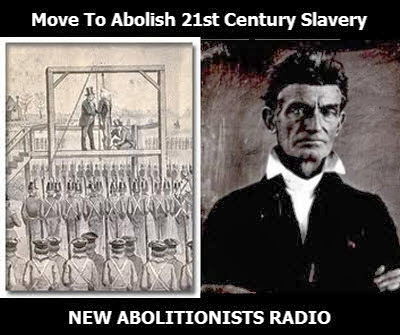 Join the hosts of New Abolitionists Radio as they discuss the issues and news related to 21st Century Slavery & Human Trafficking and feature those who enforce slavery in the Overseers Chronicles. 30 years since its creation when two retired military officers and a former prison administrator founded the Corrections Corporation of America (CCA), the first for-profit prison company in modern America. The state of California Commits the crime of human trafficking and Ships Prisoners Out of State to "Reduce" Its Prison Population. In the Overseer Chronicles, we report on the 18 current, former L.A. County sheriff's deputies who face federal charges. Prosecutors say they found a 'wide scope of illegal conduct' by deputies and supervisors that went beyond mistreating inmates. We’ll add our perspective. The Black Talk media Project is having it’s first fundraiser and we’ll tell you how you can help. Our profile in abolitionism is Gabriel Prosser (1776 – October 10, 1800). 12/2/2013 international day for the abolishment of slavery goes by without fanfare. The revolution ain't over yet. Remembering the price of freedom, The Chairman Fred Hampton. The ACLU calls for a ban on juvenile solitary confinement. The Obama Justice Department wins court case to keep thousands locked up under old drug laws. Our profile in abolitionism is John Brown (May 9, 1800 – December 2, 1859).